Forty-nine year old Raymundo Velasco was hired to clean up the beaches around Lake Osborne, Florida. He said he was dragged into the water but somehow escaped. He then simply went back to work after putting on a makeshift bandage. It was a neighbor in the area, Anneli Kuebler, who noticed the injury and called a sheriff’s deputy for help. Raymundo was taken to hospital to have his injuries treated. The greatest disaster suffered from animals according to the Guinness Book of World Records was an attack in 1945. The animal responsible? The infamous crocodile. In 1945 on Ramree Island an estimated 900 Japanese soldiers were fleeing the allied forces. The were trying to reach their second line of defense. In order for them to reach this position they had to cross 16 km of swamp. One of the allied soldiers, Bruce Wright related that the “night was the most horrible that any member of the motor launch crews ever experienced. The scattered rifle shots in the pitch black swamp punctured by the screams of wounded men crushed in the jaws of huge reptiles“. When the allies did reach the Japanese position a few days later there were only 20 soldiers left alive. It is believed that about 500 soldiers were able to escape off the island and some of the Japanese died from thirst, starvation, disease, poisonous snakes and insects. However, many of the soldiers fell victim to the thousands of crocodiles who made the swamp their home. Exactly how many will probably never be known, but what is known is that the number from all accounts must have been staggering. In April 2007 a vet at the Shaoshan Zoo in Taiwan, learned the hard way that even a sick crocodile is a dangerous crocodile. Chang Po-yu was injured when he entered into the crocodile area with only a syringe in an attempt to treat the sick animal. The animal responded by tearing off his arm. Lucky for the vet, other zoo workers reacted quickly and fired several shots at the animal. The animal dropped the severed limb and they were able to retrieve it. The severed arm was then taken to the hospital where surgeons were miraculously able to reattach it. Chang recovered from the incident but has had to undergo numerous follow-up operations and physiotherapy. 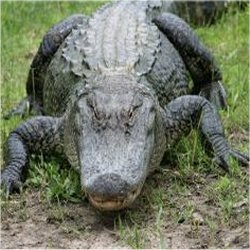 This entry was posted in Animal Trivia and tagged alligator facts, alligator trivia, alligator trivia attacks, alligator trivia facts, animal attacks, crocodile attacks, crocodile trivia, gator trivia by Jane. Bookmark the permalink.